How are you doing with your money? Is your checking account flourishing? Do you have a well-stocked savings account, a growing 401(k), and an emergency fund ready to save you from life's unexpected money mishaps? That's great news. These are all signs you're out of the minor leagues and are now a major player in the world of personal finance. Here are a few more. When you are in full control of your finances, you know where your money is going, when it's coming in, and you have a pretty good idea of all your balances at all times. You keep track of your spending and you see the numbers you expect to see when you log into your bank or credit card account. This is a far cry from the days when checking your accounts was like a horrible game show moment ('Let's see if there's any money behind door Number 1!'). You may not even notice this good habit anymore, but you can feel good knowing those panicky peeks at your balances are over. A massive tax refund is not a smart way to manage your money. By overpaying your taxes, you are giving the government an interest-free loan all year while you miss out on investment opportunities and the benefits of compound interest. Finance rookies overpay their taxes because a refund feels like a windfall. The fact of the matter is that money should have been in your paycheck all along. No one wants to owe money at tax time, but if you calculate your withholdings correctly, you should come out as close to $0 as possible. That means you're taking advantage of every cent you earn throughout the year. Most of us are going to carry at least some debt for a chunk of our lives; after all, it's difficult to pay for a home with cold, hard cash. But excessive monthly debts mean that your finances are not as shipshape as they could be. When was the last time you checked out your credit score? It's a good idea to do it once a month, because erroneous things can creep up. Now, take a look and see where you are on the credit rating scale. Saving money when you can is great, and you should always try and pay yourself first. However, if you have automated this system, you have taken a much bigger step toward financial freedom. This is a tough one. The sad state of affairs is that as many as 78 percent of Americans are currently living paycheck to paycheck, according to a poll by CareerBuilder. Wages have stagnated, and the cost of living has risen dramatically compared to income. However, a chunk of that 78 percent are living this way due to a lack of budgeting, discipline, and overwhelming debt. Even people earning over $100,000 a year are living like this, and that's just unacceptable. An emergency fund is just that; a stash of money that can be used for a crisis, such as losing your job, unexpected home repairs, medical care, and even emergency travel. Ideally, this fund should cover at least six months' worth of daily living expenses for you and your family — even more if you have a high-paying job or unique living expenses such as a medical condition. Have you ever seen people play fast and loose with their bills? They will choose to pay some one month, and others the next. But sooner or later, everyone has to pay the piper. Utilities will get shut off, debt collectors will call, and credit scores will tumble. And, it often costs even more money to put things right. If you pay all your bills on time, every month, you're doing a fantastic job with your finances. 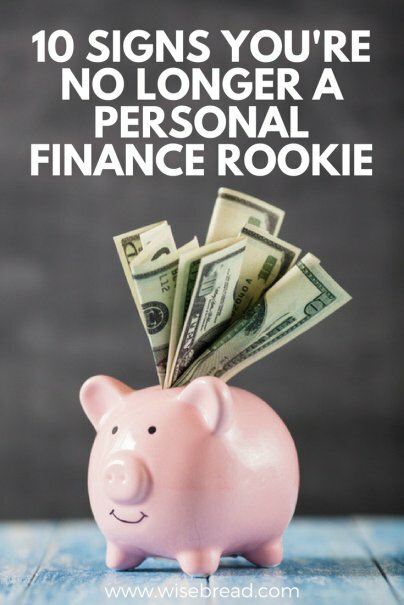 It takes willpower to shed the 'personal finance rookie' title, and if you are no longer throwing money at purchases without thinking, you have moved beyond that role. Perhaps the most important item on the list is a monthly budget. In fact, if you adhere to a monthly budget, most of the other habits on this list will follow naturally.